….as PEI can welcome another Grit government for 4 more years! And, as a sidebar, the Cons kept true to form in using personal attacks during the campaign to try to gain political advantage. The premier used most of his victory speech to condemn the personal attacks he says he suffered at the hands of Progressive Conservative Leader Olive Crane. “To my family — my mother, my in-laws — you didn’t sign onto this. I apologize that you had to go through some difficult times,” he said. Crane and others accused Ghiz’s friends and family of benefiting from the controversial Provincial Nominee Program. Midway through the campaign three former provincial government workers came forward with accusations of government officials accepting bribes from potential immigrants. They passed the allegations on to federal Immigration Minister Jason Kenney, who referred them to the RCMP and Canadian Border Services. Ghiz’s mom, Rose Ellen, has been in politics her whole life, and she says she’s never seen anything like it. “This was probably the dirtiest campaign. I have no problem attacking someone on policy. It doesn’t both me one bit,” she said. “But when you get personal and, when the personals are lies, that is what really is upsetting. Yeah, yeah… I and everyone else was off base last time when all of we so-called “pundits” tried to pick the outcome of the May 2 election. And I have learned my lesson and won’t do it again. I love trying to predict outcomes of elections! Back in the old days (before May 2, 2011), I was even pretty good at it… came close a few times to nailing it. And I think they’re close… of all the prognosticators out there, I put the most faith in these guys because of their methodology (I won’t go into details, but I as a statistician can attest to its robustness). 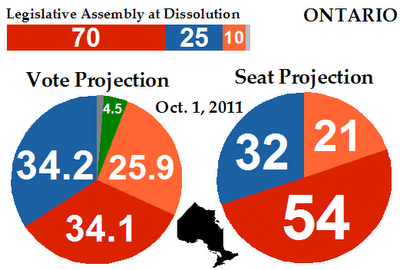 Yet I think this projection gives to little weight to the NDP factor. Yes, Timmie Hudak and his merry band of tax fighters and gravy finders have managed to totally screw things up for the PCs. Yes, they have projected the wrong messages in the wrong way. And yes, they have alienated many in their own party… BUT… they will still win 30+ seats. Maybe as high as 35. However, the real threat to the Libs at this point is that lingering “Layton effect”. I think that some soft Grit supporters will switch to the Dippers once the ballot is in front of them. And this will lead to some NDP gains in some close ridings (i.e., Ottawa Centre). So I see the NDP in the 25-30 range while the Liberals will limp out with a minority government with 45-50 wins. What follows next is anyone’s guess. Um, am I dating myself? “Mug’s game”??? Really, Trashy?? ?